One of the advantages of working with a project that reaches across the borders of countries and cultures is the opportunity to meet other people passionate about their interests. This is what we found in the Museum for African Art located in New York City. In response to our plea for support they offered up their catalog and said, “Pick something.” We believe we found a treasure that expressed what we were trying to accomplish and did so within the spirit of our project. We selected a wonderful book entitled Personal Affects: Power & Poetics in Contemporary South African Art. Participating artists include Jane Alexander, Wim Botha, Steven Cohen, Churchill Madikida, Thando Mama, Mustafa Maluka, Jay Pather, Johannes Phokela, Robin Rhode, Claudette Schreuders, Berni Searle, Doreen Southwood, Samson Mudzunga, Clive van den Berg, Minnette Vari, Diane Victor, and Sandile Zulu. Exhibition catalogue with Introduction by curators David Brodie, Laurie Ann Farrell, Churchill Madikida, Sophie Perryer, and Liese van der Watt, and essays: The Enigma of the Rainbow Nation: Contemporary South African Art at the Crossroads of History by Okwui Enwezor, Towards an ‘Adversarial Aesthetics’: A Personal Response to Personal Affects by Liese van der Watt, and artist interviews by Tracy Murinik. Published by the Museum for African Art, New York and Spier, Cape Town. September 2004. 176 pp. It is through art (and writing) that our species expresses those things which touch us most deeply, that give rise to all that is good, and bad, within us. It is how we convey emotion and thought across language and cultural barriers. Understanding the power of the word and art will prepare the students of Kiguli for a lifetime of successful leadership in their homes, communities, and perhaps their nation and the world. The museum book is part of a package making up the perk for a $100 donation to 2013 Songs of Kiguli. We labeled this perk “Hill of Antelopes” which is taken from the name of the capital city, Kampala (Kasozi Kempala). Won’t you join us in supporting a cause that gives us an opportunity to reach out, person to person, and help build a better world? Just one more thing, helping to pull this project together will make the smiles on nearly 700 children that much more bigger and brighter! Stop by our fundraiser and check out all of our perk packages. We only have 6 days to go. We have received dozens and dozens of complements on the project and the work to date. That, of course, is appreciated. It is time, however, to back up all that praise with a bit of cash. Help us deliver on a promise to light up a corner of Africa with poetry and music. Why is a book of poetry, The Songs of Kiguli so terribly important to bright and inquiring minds living in the rural areas of Uganda? The Kiguli Army School was originally founded to provide an inexpensive education to the children of soldiers in the Ugandan Army. At inception it was registered as a Universal Primary Education school or UPE. 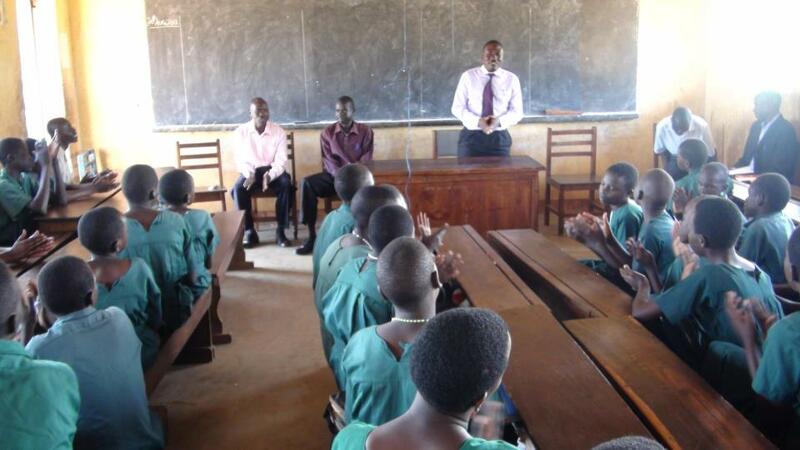 UPEs were set up by the government of Uganda to provide free primary-level education to children across the country. Registration does not mean that the operating costs of the school are covered. Books, stationary, school meals, and much of the salaries paid to teachers and administrators are not covered. The cost of teacher salaries was not supported by the government until 2001 since the ministry of education had difficulty locating the registration number. From the organization of the school until 2001, the teachers were paid out of the army’s “Rational Cash Allowance (RCA). This is a fund providing small stipends for soldiers. In 2002 things began to change for the better. Luwero Industries, Ltd. Provided a location for the school and constructed 4 classroom blocks. With this contribution came more students from the families of workers at Luwero. 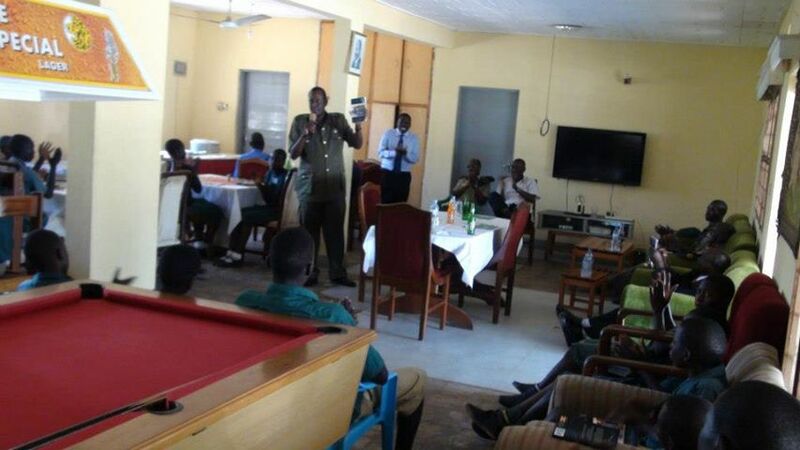 The school is now providing education to the Nakasongola military fraternity and the children of Luwero workers. The school is able to keep the contribution required from the families to a reasonable amount due to the proximity of the campus to corporate housing, local villages, and the homes of the fraternity. “Reasonable cost,” of course, is a relevant term. Education is being provided with the materials at hand. But the school desperately needs a number of items not covered by the government, fraternity or corporate support. Many of the students travel some 4 km to and from school. Reliable transportation is required to and from athletic events. A maintenance vehicle is needed as well as repairs to the original buildings. A library has been started and it is in need of more inventory. The expanding school could also use more space. The teachers and the administrators would like to see the school lunch program expanded. It is true that the sale of this little book of poetry, along with its companion DVD and the 2012 edition, will help raise funds to support the projects required by the school. PDMI Publishing, LLC, is doing its best to build the kind of marketing program that will generate the required interest in this project. But there is far, far more. One short review of the thank yous that flow from this rather large school give you some idea of the impact the simple act of publishing can have on the spirits of the students themselves. Although the poems show that they are already far along the road of understanding the circumstances of their country and the world, this book gives them the sense that they have the power to change things for the better. Something THEY do can have an impact. Won’t you join us in training and inspiring the next generation of thoughtful, compassionate leaders of this African nation? Check out the web page and the Facebook link on my side bar. Here we go with another article in my series about the 2013 Songs of Kiguli project. The 2013 edition of Songs of Kiguli will be released by PDMI Publishing early this fall. There will also be a DVD with footage of the school and of the students reading their own poetry. In addition, Qwela has graciously agreed to support the project with their music. Qwela is a band from Kampala, Uganda with a “unique afro-fusion flavor of music.” Qwela means pure in rukiga, which is one of Uganda’s ethnic languages. Although influenced by western culture, members of the band were raised in traditional African families. Their work is original and it fuses the traditions of their culture with western styles such a jazz and reggae. The mix is their own special interpretation of Uganda and its people. Qwela formed in 2007 and started their career by producing their own versions of popular contemporary music. As they grew in their art, so did their repertoire. Now they produce their own music and are a featured act with a following. In addition to the influence of jazz and reggae, the band draws on inspiration from rumba, blues, gospel and afro-soul rhythms and sounds. The band’s music blends African rhythms and melodies with socially conscious lyrics that support and illuminate stories with a message. Qwela’s mission is to help bring about positive change in the hearts of those living in Uganda and those around the world. When you visit their page on Reverbnation you should note that 50% of the proceeds from their music go to World Vision. For these reasons, and many others, they made a perfect match for the Songs of Kiguli project. Their music speaks directly to the lives, dreams, hopes, and needs of the children in the Kiguli Army School. They express the heart of the project in song. Selected music, lyrics and videos can be found on Reverbnation, Qwela. Qwela and The Songs of Kiguli are doing just that. Another piece that will be on the DVD is the story of Okello, a child kidnapped from a burning village to become a warrior in war that is not his. The tale and the music are haunting. Don’t you cry, Mama tokaaba saying, everything is gonna be alright, it’s gonna be alright, it’s gonna be okay. Kiguli Army primary school is populated by 687 students. These students come from diverse backgrounds, experience and lifestyle. Mostly, they are dependents or orphans of the Ugandan military fraternity. 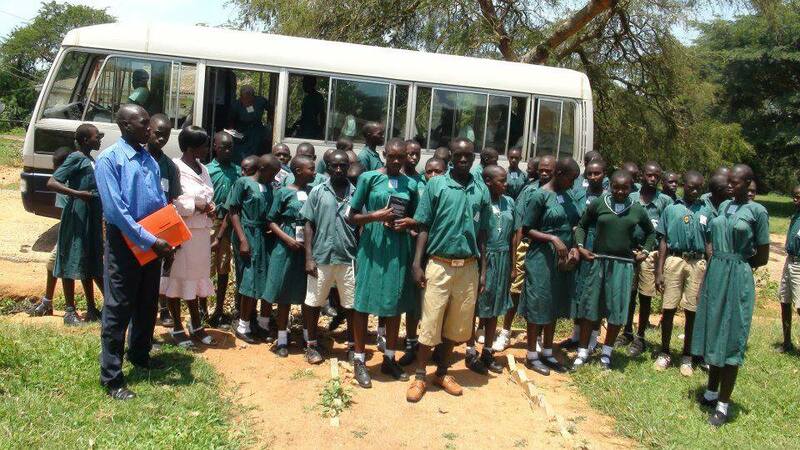 The school can be found on the hinterland closest to the shores of Lake Kyoga, Uganda. Lake Kyoga is a freshwater lake that supports several landing sites and fishing communities from which many a Kiguli student hails. Some of the children’s parents work in the Ministry of Defense ordnance factory called Luwero Industries Limited. The school has thus been made the centerpiece of the company’s corporate social responsibility plan due to filial as well as patriotic links. The school is also located in an area that is part of a re-forestation project being conducted by Luwero Industries. The school is a primary school, not a military or boarding school. It is not grooming new soldiers. There is a premium placed on discipline, hard work and service to the wider community. These, we believe, are the three legs of the school’s ethical stool. From Primary One through Primary Seven, the students learn Social Studies, Mathematics, English and Science. No one is promoted until they accomplish the work required for the next level with a passing grade. These subjects are buttressed by extra-curricular activities such as football (soccer), volleyball and athletics. The school has won several district athletics accolades. It is currently poised to enter a district-wide football showpiece that will highlight the children’s unrivaled skills in this sport. 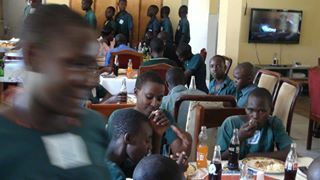 Academically the school has churned out the best students in Nakasongola district in Maths and English for several years on the hop. And this is good for the nation. Admittedly last year the school experienced a dip in such stellar academic achievement. This was due in part to the increased costs of living and falling standards of living in Uganda. Despite of this decline in academic scores, the best student last year was given a bursary in a school near the national airport in Entebbe. He is currently topping his class. Sadly, the rump of Kiguli class of 2012 fell dangerously behind. These children teeter on the precipice overlooking the abyss daily and without this education, there isn’t much promise for their future. It is common for some to fall by the wayside and find themselves as fishermen whose moral dereliction leads to a large seraglio of women and zero prospects beyond living hand to mouth. That’s the boys. The girls end up pregnant as teenagers and faced with a life of poverty with little or no chance of improving their lot. The school needs a break, too. It provides porridge as the sole meal to the kids but obviously such sustenance for a child (indeed anyone) is way off the mark. We could use help developing a more nutritional cafeteria program. The buildings of the school are in a state of disrepair. The parents, Luwero Industries, and other well wishers have put together some funds to repair and renovate the school. But this is a drop is a large ocean of need, especially in light the constricted operating budget; the teachers earn a pittance or volunteer. Yet, we have a strong sense of mission. And we have faith that initiatives such as this project will flip the floundering fortunes of this school and its glorious, inspiring students. So, what can a poetry book do to combat such a mountain of obstacles? A lot. This project, The Songs of Kiguli, has given the children a belief in themselves. That’s why even though the majority of the 2012 class didn’t make the grade academically, they continued on to secondary schools of relative repute. This little poetry project is a major boost and helps fill our kids with the inspiration and the belief that if they can pen a published anthology, then they can repair their lives. Here are just a few of the little miracles our little book of poetry has sparked. Ryan Masaba was a contributor to The Songs of Kiguli 2012. Although he was 3rd in a class of 56 pupils, his grades didn’t measure up on a national level. However, he was able to parlay his contribution to Songs of Kiguli 2012 into an acceptance at a top-drawer Kampala secondary school called Mengo Senior Secondary School. When the headmaster of that school took a look at the anthology he was impressed with this budding poet of Kiguli renown. Kiguli Army School also attracted pen pals from Florida under the caring tutelage of Mrs. Katherine Rascoe. She was duly impressed by the words woven into a tapestry of poetry in the anthology. She and Philip Matogo developed a “poetry without borders” program as American and Ugandan kids shared poetry and experiences reflected through their own words. The anthology was the key that created an international relationship between the future leaders of both countries. Both student bodies could share their artistry in poetry at a level beyond the customs and waters that divided them, learning about the things they shared as well as those that made them different. Songs of Kiguli also caught the eye of the then Uganda Chief of Defense Forces, four-star General Aronda Nyakairima. He is currently the Minister of Internal Affairs. He was flummoxed by the beauty, honesty and maturity of the Songs of Kiguli. He, at the time, thought that the writing was so good that it could not have come from rural kids deprived of the perquisites that benefit Kampala children. Another General that was impressed by the words conjured by our children was Brigadier-General James Mugira who is also the Managing Director of Luwero Industries Limited. He is a patron of the primary school and was totally taken aback by the children’s brilliance. Thus the army of Kiguli poets had enlisted two powerful generals to its cause. The school indeed stands upon the cusp of monumental achievement. All these students need is a way to effectively express themselves and they will find the path to a stronger future. This is what this project will give them. Their poetry goes a long way to highlight their own circumstances and talent however it will also throw a spotlight on what ails the people of Uganda, and Africa as a whole. A people whose time has surely come. That moment in time will shine far beyond any 15 minutes of fame. Check out the 2013 Songs of Kiguli fundraiser now! Donations start at a dollar and there some awesome perks. This week I’d like to introduce a new found treasure and a contributing artist to the 2013 Songs of Kiguli fundraising campaign. His name is Bob Salo and he is a world traveler. He interprets what he sees by creating some truly exceptional art. I bumped into him while I was looking for interesting perk prizes for the fundraiser. He is, in a word, ideal. Bob travels around the world looking for subjects, and moments, that feed his artistic eye and his heart. He is a professional videographer, cameraman and graphic design graduate of the Ontario College Of Art in Toronto Ontario. He acquires a vast variety of visual elements and “moments” and returns to his studio to recreate the vision he first saw and felt. It is his mission to express what he felt at the time he captured that perfect moment with his camera. All of his work is by hand using a computer graphics program that allows him to simulate any medium he chooses with a pen on a Wacom tablet. The incredible brushes that can be assigned to his electronic pen can simulate the painting feel and action of watercolor, oils, pastels, or whatever; but the expression itself is still in the control of the hand and the eye of the creator for the enjoyment of the beholder. Some of these captured moments were just perfect for the Songs of Kiguli. We selected two prints to give as prizes for the Lion and Elephant perk classes and those prints are shown here by permission of the artist. 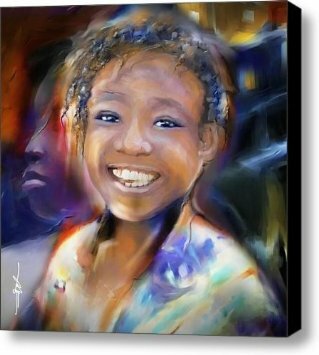 You can find Bob at Fine Art America, Amazon.com and at his own website. 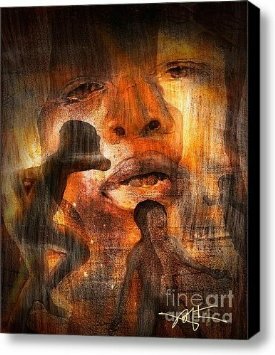 Check out the terrific collection of works available on his sites! Better yet, stop by the Kiguli campaign and you can have either “Returning a Smile” or “Need for Understanding” AND help out a great project. This link will take you straight to THE spot! This week I’d like to focus on a project that you will find on my side bar for the next 30 days or so. Ever since becoming involved with PDMI Publishing I have met some of the most interesting, energetic and creative people I have ever known. 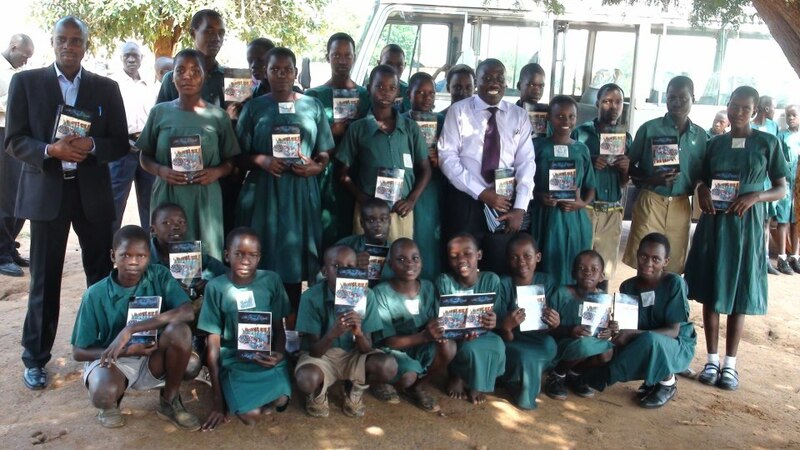 Last year PDMI Publishing produced a book of poetry written by students in Kampala, Uganda. I reviewed the work here. That was only the beginning. This year a number of us decided we would do something a bit more, well, a lot more extravagant. This year we are printing a whole new volume and reprinting the first volume. We are also putting together a DVD of the students reading their poetry along with some footage from the school. The whole thing will be backed with the truly talented Qwela band, also of Kampala. Qwela has an amazing sound of a “unique Afro-fusion flavor of music.” Qwela means ‘pure’ in Rukiga. Their lyrics speak of family, current events, a love of their tradition. The pieces selected for the DVD include Mwana Wanji, Okello, and Mama tokaaba. Okello is the story of a child kidnapped by the rebel armies after his village is burned to the ground. After being trained as a child warrior, the memory of his mother still calls him to his childhood dreams. He runs away from his abductors to find the life he really wanted. Mama tokaaba is a beautiful song sung almost entirely in African dialect. It is about family, reassurance, and the promise that “everything’s gonna be alright.” Mwana Wanji, which is also on the trailer, means My Child. The words of the song are quite powerful in the context of the country today. I’d like to note that the link I provided for Qwela states that 50% of all sales go to World Vision. These people are serious about building a different future. That brings me to these enterprising young people. Their volunteer teacher, Philip Matogo teaches them social sciences, English and journalism. The poetry produced in this classroom indicates that these children are well aware of the Geo-political and local socioeconomic and political circumstances they live in. It is our hope that this little project can give these students a very real way to impact their world, their education and their future. Come check it all out and help us meet a rather modest fundraising goal.